I've always considered Christmas and the holiday season to be a time to look backwards, steeping yourself in the traditions that have made indelible memories for you. When it comes to literature, a tradition I have held close to my heart since childhood is reading Charles Dickens’ A CHRISTMAS CAROL every year --- usually before I fall asleep on Christmas Eve. 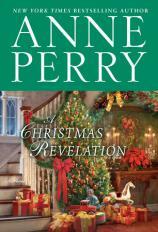 Another is looking forward to Anne Perry's annual Christmas mystery, which I have done for the past 15 years. Some of the books are immersed in Yuletide, while others are mysteries that just happen to take place during that time of the year. These stories allow Perry to venture away from her regularly featured protagonists, like William Monk and Charlotte and Thomas Pitt, and occasionally make one of her tertiary characters the center of her Christmas tale. "Since this is an Anne Perry novel, readers will not be surprised to learn that it is expertly plotted with revelations at every turn --- all of which ties up into a nice Christmas bow in the touching finale." This is definitely the case with A CHRISTMAS REVELATION as we get to spend some quality holiday time with nine-year-old street urchin Worm and his often unwilling colleague, the curmudgeonly old bookkeeper Squeaky Robinson. Both are connected through the clinic run by Monk's wife, Hester; despite the many decades separating them, Worm and Squeaky are sort of family. A few days before Christmas, Worm notices an elegant woman being bullied and manhandled by two men, who lead her forcibly into a residence with which he is unfamiliar. Worm runs back to the clinic and alerts Squeaky to what he has witnessed. But Squeaky is initially more concerned with preparations for the Christmas celebration and meal that is just a few days away. Eventually, though, Worm wears Squeaky down, and he agrees to accompany the lad to the location of the assault. Squeaky also wants to keep an eye on Worm, who he knows would have gone after the men on his own. They find the woman alone and learn that her name is Eloise. She won't reveal what the thugs wanted from her, just that it had something to do with her late father. Squeaky doesn’t buy her story completely, but having come from the streets himself, he is well aware that a good lie must contain some element of the truth. Worm, Squeaky and Eloise hatch a plan to trap the two hoodlums and essentially get them to turn on each other. The treasure they seek is gold, and Eloise's father has hidden it quite cleverly. Since this is an Anne Perry novel, readers will not be surprised to learn that it is expertly plotted with revelations at every turn --- all of which ties up into a nice Christmas bow in the touching finale. A CHRISTMAS REVELATION is another welcome holiday guest and a fine Yuletide read.